Living DNA offers what may be the most advanced testing of any genetic genealogy company. The testing goes past the typical autosomal “family DNA” offered by other companies and extends to your maternal DNA (mtDNA) and paternal DNA (Y-DNA), which are typically only offered as separate tests with other companies. The reports are arranged in 3 sections, your family ancestry, maternal line, and paternal line. The company provides users with an overview of their ethnic heritage going back about 10 generations with a remarkable level of detail. The testing matches ancestry down to 80 specific regions of countries, including 21 just for the UK and Ireland. It also provides an interactive map called “Your Ancestry Through History.” This serves as a sort of timeline showing where your ancestors lived beginning about 1,000 years ago. Moving backward you can trace their migrations over the eons, and learn about the various time periods. By analyzing your paternal DNA, researchers can look back around 180,000 years and estimate the migration routes of your ancient ancestors. Living DNA puts a big emphasis on privacy and security when it comes to user results, which are posted online through the company’s website and can only be accessed by the user. The tests are autosomal, which means they cover the autosomal chromosomes who provide the most detailed information about DNA. Living DNA tests all 23, and through their battery of tests can provide users with intricate, rich results that are unsurpassed in the industry. The tests are also highly appealing to people who would like to take part in wider DNA research. With the user’s consent, Living DNA will enter individual information into a wider database that can be used to study human DNA, and further the company’s mission of showing that all humans have the same common ancestors. Living DNA is for people who want more details and want to delve into the fine print of where they come from. Living DNA says to expect the tests to take about 10-12 weeks, and according to user reviews online, this is no exaggeration. During that time the tests are sent to 2 separate labs, and can often get backed up if there are a lot of orders, especially around holiday season, when DNA tests are a popular gift. The tests can be expensive – as compared to the competition – but the company does have a unique approach to DNA testing and what it means in a wider sense for society. In the labs, user samples are put through a battery of tests which have no rival in the business. The company tests use maternal and paternal DNA, combining both under one roof, unlike other companies which package them separately. The “Your Ancestry through History” feature gives a fascinating look at your ancestors’ voyage through history, and places them squarely in the greater context of humanity’s voyage from our origins in Africa to all points beyond. It’s a unique approach, and one that sets Living DNA apart. The Living DNA kit is straightforward and easy to use. It includes a paid envelope and 2 vials, both of which come with cheek swabs. One of these is the sample and the other is the backup. You swab your cheeks, put the swabs in the vials and put them in the paid envelope and your work is done. It’s just a matter of waiting for the results from this point. Living DNA gives you an overlook of your ethnic heritage going back 10 generations, and then breaks down the specific geographic regions where your ancestors lived. The results are split into 3 sections – family ancestry, mother line, and father line. It goes back even further than 10 generations though to see your deep ancestry, tracing your distant ancestors’ migration from Africa to the modern era. The tests show users their maternal haplogroup (a haplogroup is a group of related subclades, which are sets of genetic markers) and where it’s most concentrated geographically. The tests will show you the locations and history of your haplogroup over time and how it migrated from Africa. The tests give male users their patrilineal genealogy and will also show you which populations across the world have the most in common with your autosomal DNA. You can also take advantage of the interactive map feature where you can trace your ancestors’ migration over time. Living DNA hosts an online help center where users can turn to find answers to all types of queries. If the help center doesn’t provide answers, customers can turn to the company by email and by telephone during business hours. The company says it does the best to reply to emails within a few hours during business hours, and that if outside business hours it should take longer. There is also an online query form that can be filled out to find answers. Without any discounts, the kit costs $159, which is higher than many competitors, but there are often discounts. For instance, at the moment, the site offers US customers a special price of $99 for a test. You can also order a personalized ancestry book for $69. The standard shipping to receive the test is $9.95, though premium delivery (2-3 working days) is much pricier at $39.95. Living DNA provides a unique genetic mapping product that utilizes a highly intricate series of tests and parameters. The insight provided by the tests is more detailed than other companies and really presents a very rich macro and micro look at users’ roots back deep into ancient history. The interactive map, patrilineal testing, and geographic mapping of results are rare in the industry, and part of what makes Living DNA a solid choice for people trying to learn about where they come from. Not only that, the company is devoted to a mission of showing how we as humans are all connected, and by taking part, perhaps you can take one small step to breaking down the artificial constructs that divide us. 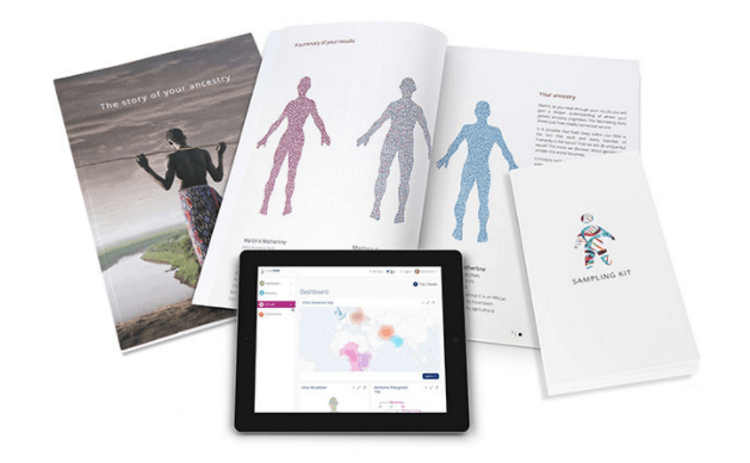 Living DNA was launched in late 2016 in London, and is run by DNA Worldwide Group, a DNA testing firm which has been in operation since 2004. The company uses over 100 scientists and experts who it says are devoted to the mission of unearthing more and more about humanity’s common bonds.